One of the biggest arguments/fights John and I got into was in mid-November when I took Ari with me to a good friend’s 30th birthday party. Ari was just shy of 30 days old, and I took her without confirming that every single person at the party was free of disease, though I did hand out Purell as soon as I walked in the door. In all honesty, John was right to be miffed as he was, though, in my defense, I thought exposing her to some germs was probably safer than spending another night in the care of a sleep-deprived mommy with a case of cabin fever so severe that she thought she might literally push her head through a window. I know we medicine types must seem crazy overprotective when it comes to newborns. It’s because we know what’s in store for them if they even hint at being sick. Turns out these little tikes can somewhat easily develop what we call a Serious Bacterial Infection (SBI), such as meningitis, pneumonia, pyelonephitis, and gastroenteritis. Fever may be the only sign of illness. Evaluation of a potential SBI includes a full sepsis work-up: blood work; urinalysis via catheter; lumbar puncture; chest x-ray; possibly CT, MRI, and ultrasound of the head in cases of meningitis. The treatment for an SBI includes empiric antibiotics and hospital admission. No fun. Possibly the most un-fun situation you could imagine except, of course, not providing empiric antibiotics and admission to a kid who actually has an SBI. If the kid is 28 days or fewer in age, he is considered to be at high risk of having an SBI. Therefore, a full sepsis work-up, hospital admission, and antibiotics are required. Age 29-60 days is a grey area. There are a number of different protocols used to determine which infants in this category require the whole rigamarole . In Philly we, not surprisingly, use the Philadelphia protocol. A full sepsis work-up, pleasant as it is, is still required to determine which kids are at “low risk” and can therefore be sent home without antibiotics as long as there is assurance of 24-hour follow-up. Although there is no protocol, that I know of, that guides our treatment of the febrile infant at 61-90 days of life, I understand that most pediatric emergency med docs are cautious. If a kid less than three months old comes in with a fever, he’s likely to undergo the diagnostic work-up. 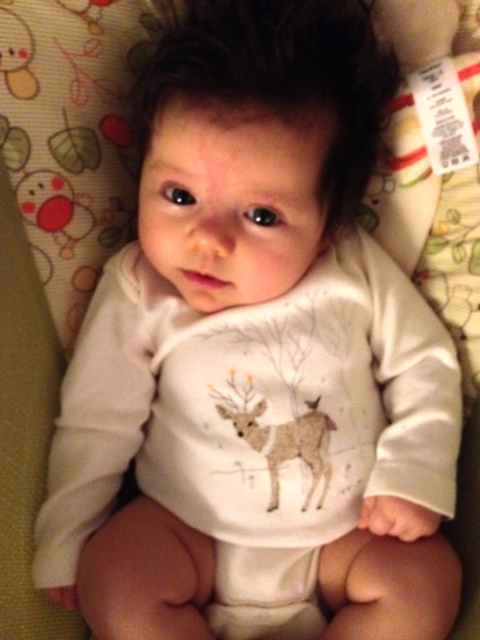 Therefore, it is with one great sigh of relief that I quietly celebrated Aurelia’s three-month birthday yesterday! She’s still pretty squishy, but she seems just a little stronger each day I get to know her. We got through three months with nothing worse than a little reflux and labial adhesion (yeah, that apparently is a thing…don’t be too aggressive with them wipes! ); nothing some zantac and estrogen cream can’t fix! Have not posted in a while, been working on my website of internet changes in medicine, in which I would like, at some time in the future, feedback from a real live medical student. I can see both sides of the argument of bringing the little tyke out at such a young age. As a doctor, I can see dads POV. But as the son of tough parents, who did not believe in antibiotics, I can see your point. My parents raised five professional athletes (one played for the Flyers, by the way, in your wonderful town), and I played for a World Hockey league team in Philly too. the point is, my parents were tough with us, we never went to doctors, were raised that way, and we all never had any major health problems. Now, when we take antibiotics, they work. Don’t know if that would be the case if we were given antibiotics for the sniffles when we were young. I think now that we don’t have to worry quite as much about meningitis or encephalitis, we’re both a lot less paranoid. Five professional athletes??! Whoa! And I’m so glad Philly treated you well! Happy three month birthday! She’s so beautiful, just like her momma. Aw, thank you! So much love! Anna, I get the 3 month time thing. But I also believe that you can be to careful too. But you guys will work it out for yourselves. I read Dr. Spock you have Sears. I will say that Dr. Spock had good things to say, but I also think I had a mind of my own and used some of his advice and created my own way. I loved Parent mag. I really got good stuff from them. I just think it is wonderful that any parent reads a parenting type book. Just means you want to do your best as a parent. Thanks so much, Christine. Love the suggestions!